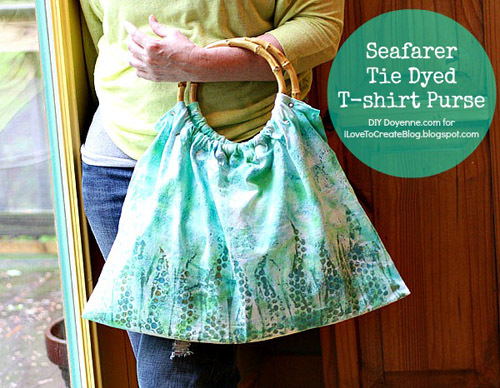 It's my mission this summer to make chic and stylish Tie Dyed projects. Tie dye doesn't have to be stuck on Dead Tour or at summer camp. The trick is a mixed media approach, with several layers of dye and paint creating the look of seaweed swaying on the ocean floor. Best of all, you don't even have to sew! Fun, fast and fabulous! 1.) Wet shirt. Place on sheeting. Slide pinched fabric into fork and twirl. Repeat for entire front of shirt, making rosettes. They should be swirling in different directions. 2.) Mix dye according to instructions. Squeeze into plastic containers. 3.) 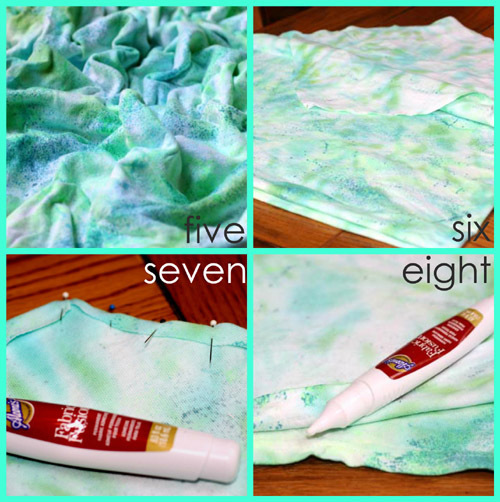 Use a brush to paint green dye on raised areas of shirt. Leave some areas white. 4.) Use second brush to paint blue dye on remaining raised areas of shirt. 5.) Turn shirt over and repeat process on back. Cover with plastic and allow to set for 4 hours. 9.) Cut a section of small bubble wrap into three pointed waved shapes. These are about 2" wide at the bottom. (These are meant to look like seaweed, but they also look a little like octopus tentacles so you could go that direction if you choose!) 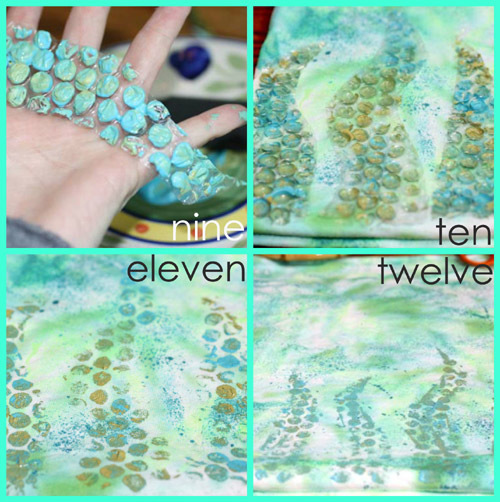 Squeeze blue and green Tulip Soft Paint on a plate and use pouncer to gently pounce paint on bubble wrap. Don't mix the colors up, put some blue here and some green there to give it variety. 10.) Press bubble wrap across on bottom edge of purse fabric. Move across bottom edge, leaving a small space between each tendril. 11. They should look like this when you lift them up. 12.) Use pouncer to add some detail to the stamped areas and in between. ALLOW TO DRY COMPLETELY! 13.) 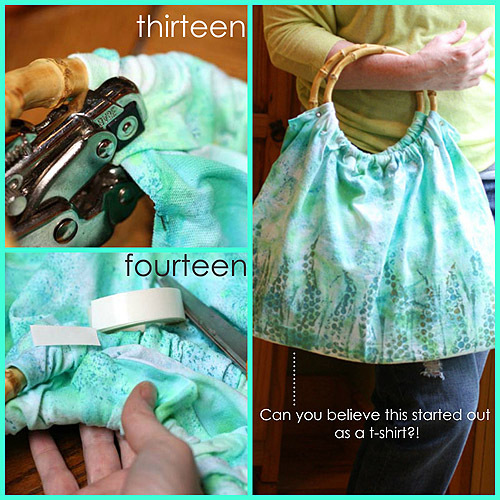 Fold top left edge of fabric over purse handle and use a grommet setter to attach edge, slide it down another 2" and repeat. Do this on all four sides for both handles. One handle for the front and one for the back side of your pouch. 14.) Use fabric tape to attach folded edges around handles. Work slowly across from one edge to the other, spreading fabric out as you work. You can scrunch it back down after it has set. I am so happy with how this turned out, I plan on making more of these purses! It's amazing what you can do with a few inexpensive materials and a lot of imagination. Can you believe this started out as a t-shirt? 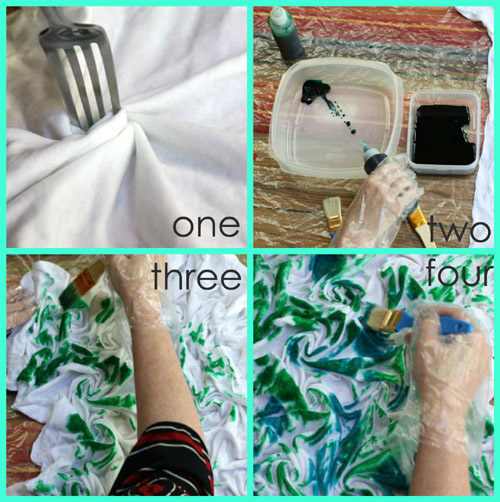 Don't forget to visit our new Tie Dye Your Summer website for techniques and projects you are going to love. 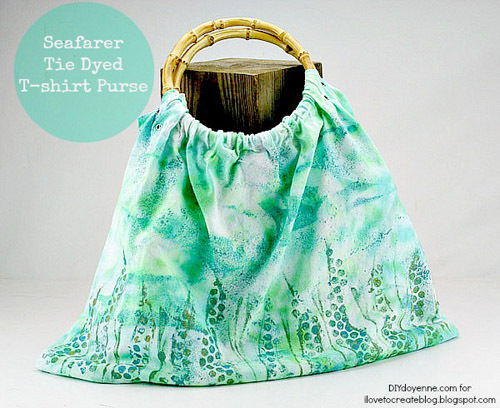 And if you want more stylish DIY and fashion ideas, visit my new site DIY Doyenne!